Determine where the chimney will pass through the ceiling and ensure that no rafters or anything else, is in the way. 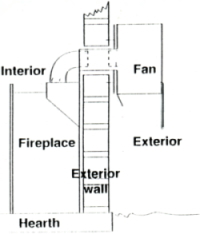 From the center point on the chimney outlet, determine the correct position of the fireplace. With freestanding models, place the fireplace in the correct position on the floor. Cut the hole in the ceiling. Move the fireplace away from correct position and push chimney through the ceiling and roof. Move fireplace back to the correct position and lower the chimney onto the fireplace. Fasten finishing plate (1) in correct position. Seal off roof and chimney (2) by using the correct sealing material - contact you supplier of fireplace. Mount cowl (3) on top of chimney. Grease the cowl. Ensure flue pipe is properly fastened to roofstructure. The chimney has two joints wich are welded at the factory. To make double sure , seal the two joints again with the sealing material on the piece of chimney above the roof. Convection of the air takes place at the back of the fireplace by air passing between the fireplace and the wall. For thatch and wooden roofs, contact your insurance broker to ensure the correct procedure is followed by your builder. Spark arrestors are available. Make sure the chimney is at least 100mm away from the nearest wooden beam or anything else inflammable. Fibreglass insulation (7) around the chimney between the ceiling and the roof must be installed where any fire hazard exists. Contact your insurers and builder. The wall against which the fireplace is to be mounted must be of good quality; otherwise the freestanding model must be used. Where the chimney is being lengthened (in most cases) ensures it is done correctly and fastened properly. For a long life paint the fireplace at least once a year, especially near the coast where oxidization is always a problem. Special care must be taken on exterior parts of the fireplace. A black enamel or rust resistant paint gives the best results. Use heat resistant paint for inside parts. NB : The heat resistant paint used on the fireplace is not weather resistant and will rust if not painted with Enamel or rust free resistant paint on outside parts. Installations are to be done by a registered LPG installer for the owner's safety and to ensure guarantee. Follow the lighting instructions strictly to ensure quick and easy ignition of your griller. A 9kg gas bottle is the minimum size required to fuel your griller. Ensure that all control knobs are in the off position. Then open the valve on gas bottle. Open the door (domestic model only) in the front of the grill by lifting handle up and pulling it towards you. Turn tub first left-hand-side control knob to the high position. Depress the ignition switch to light the burner. Note : Once you open the contol knob, light the burner immediately. Do not let the gas accumulate before lighting. Once the first burner is alight, close the door and turn on the other burners in sequence. Let the flame burn on your rock for 10 to 15 minutes prior to grilling. This will allow your heat to spread evenly. Thereafter adjust the heat as required. After use, close off all the control knobs and close the valve on the bottle. NOTE! If the jet catches alight at the front of the burner (often detectable by a loud rushing sound), turn off the respective burner to extinguish the flame. After a second or two, turn it on again. Note : Hob grills need plenty of air to work efficiently. 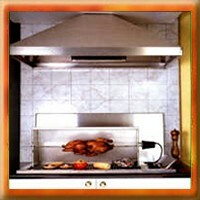 Make sure cupboard doors underneath are ventilated (louvered) or open when the grill is in use. Ensure that all control knobs on the grill are in the off position. Open the valve on your bottle. Shift the rock away from the bottom right hand corner of your rock-bed. This will expose your pilot burner. Depress the red capped knob. Simultaneously depress the ignitor button, not releasing the red-capped button. This will light the pilot flame. Continue to hold the red capped button down for about 20 seconds after the pilot burner has ignited. Release the red capped button and check that your pilot burner remains alight. Now turn on the first burner by opening the control knob closest to you, and then the others, in sequence. Note : If you only require 1 or 2 burners, always use control knob/s closest to you, lighting them in sequence. Let the flame burn on your rock for 10 to 15 minutes on high heat this will allow your heat to spread evenly. Thereafter adjust the heat as required. To turn off your hobgrill, simply close off all the control knobs and close the valve on the bottle which will in turn extinguish the pilot flame. Do not blow the pilot flame out. If the jet catches alight at the front of a burner (often detectable by a loud rushing sound), turn off the respective burner to extinguish the flame. After a second or two, turn it on again. Another safety must is to ensure that the room is adequatly ventilated. This will ensure that fresh air is suppied to compensate for the air used up in burning. 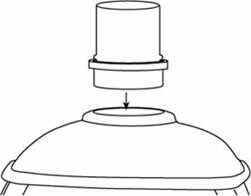 The installation of the Earthfire pot has several aspects that may seem arbitrary to the general builder or owner installer, however, these details are very important to the function and safety of the firepot. Follow all instructions with care. Please contact us if you are unclear about any of the details. Like any fire place, the Earthfire firepot is a potential fire hazard if not installed correctly, compliant with your local by-laws and building codes. (Part V of the National Building Regulations [SABS 0400] in South Africa). 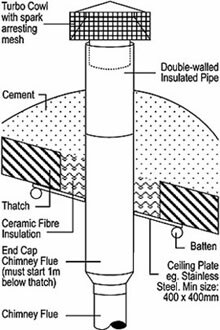 The chimney flue should pass no closer than 200mm to any combustible material without adequate insulation. The firepot itself should likewise be no closer than 300mm on either side to combustible materials and 500mm in front. Earthfire herewith specifically excludes responsibility for damages arising from whatsoever cause concerning the installation and use of Earthfire fireplaces. Take care of the lid during installation - it is most vulnerable prior to installation. It could get chipped if the edge is bumped carelessly against the pot. Take great care in insulating the ceiling and roof timbers from the flue, flue temperatures will exceed that of metal type fireplaces. See Insulation. The firepot should ideally be free-standing, although it may be positioned inside an existing conventional fireplace if that is high and wide enough to accommodate at least one length of 0.5m flue. The existing masonry chimney should be blocked off with a heat resistant board to prevent heat loss and ensure adequate heating of the room, as well as proper draw. If the firepot is free-standing, a base of durable material is essential. Tile should extend at least 600mm in front of the fire and 200mm on either side. A wrought iron stand is available to elevate the firepot, or it can be placed directly on a hearth or plinth - it looks best at about 150 - 300mm above floor level. This plinth could be made of bricks, cement or wood covered with tiles. The firepot should be positioned at least 1.0m from the closest furniture. As long as the base is fire resistant, neither the plinth nor the wrought iron stand is required for the safe operation of the firepot. However, we feel the firepot looks best when on a stand and 150 - 300mm high plinth. Make sure the site selected for the fireplace allows for the installation of the chimney. A series of bends can be used to get around roof support structures. Using a plumbline, mark the spot for the hole in the ceiling. Cut back the ceiling material at least 50mm from the pipe. Using a plumbline, mark the spot for the hole to the outside. Push the metal pipes together firmly on the ground. Make sure the pipes are joined the right way - narrow end at the bottom. (See drawing). 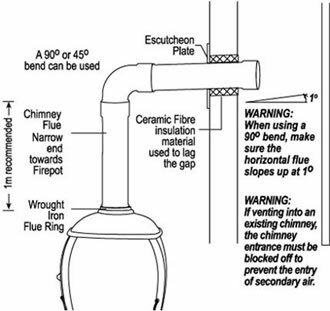 The Special A pipe is designed to fit into the lid using the Flue Ring - see diagrams below. Push the wider end of the endcap pipe through the hole in the ceiling. Insulate where it enters the ceiling and anywhere close to combustible material. Insert the Special A pipe into the lid (detailed instructions below). Hold up the lid after the pipe has been inserted and slide the firepot in underneath it. If the endcap flue alone is not long enough, insert another double-insulated flue. Fit the cowl on the end of the chimney and rivet in place. Ensure and equal overhang of the lid all round (slightly greater in front) and also position the pot to give a straight chimney line. Apply fire cement to the inside of the pot/lid join - allow 12 hours to dry - and fill the bottom of the pot with building or sea sand to just below the mouth (detailed instructions below). Dry sand only. Figure 1: Slide the Steel Flue Ring onto the shaped end of the Special A pipe. Position the seam in the pipe and the join in the ring at the back . Figure 2: Make sure the Collar fits snugly beneath the raised ridge in the Special A. Wind the fiberglass rope around the pipe below the ring. 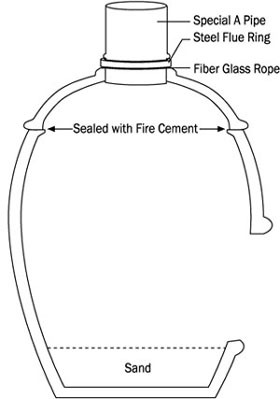 Figure 3: Lower the pipe into the Lid. Push the pipe down firmly to push the rope into the lid. Use a blunt knife to push all visible bits of the rope under the ring. WARNING: Do not apply any Fire Cement between the lid and pipe, if the pipe is not free to expand it can crack the lid. 4. Take a bit of time to position the lid squarely on the pot with an equal overhang all around the pot. Reach inside through the mouth and push fire cement into the join between lid and pot. Only apply fire cement after the lid is in position – DO NOT USE IT TO MAKE A GASKET, DO NOT APPLY ANY FIRE CEMENT ON THE OUTSIDE OF THE POT. Never force the pipe into the lid hole - it should slide in freely. Use a small grinder to take off any high spots in the lid hole. Alternatively, bring your lid to the factory or your dealer. Apply fire cement to the inside of the pot/lid join. Wait 12 hours for the fire cement to dry. Do not move the lid during the 12 hour drying period. Fill the bottom of the pot with building or sea sand to just below the mouth. See diagram. IMPORTANT: Dry sand only. The purpose of the sand is to raise the level of the fire to ensure a perfect draw and also to insulate the bottom of the pot. It is recommended that you use an insulated endcap flue protruding through the ceiling into the room. If that is not possible the non-insulated pipe can join the endcap above the ceiling. THIS IS A CRITICAL AREA FOR INSULATION: The pipe at this point is still very hot and the ceiling which is in close proximity must be insulated from the heat. Wrap ceramic fibre blanket (provided) around the flue in the ceiling hole. Even when using an insulated endcap flue, the ceiling must be cut back at least 50mm from the pipe. The unsightly hole and insulation material is then covered by a stainless steel ceiling plate. Thoroughly insulate the flue where ever it is closer than 300mm to combustible material. Also insulate the doube- walled insulated pipe where ever it passes closer than 200mm to combustible material. Extra insulation material will be provided at a small cost. The flue/roof joint can be sealed against the elements with aluminium, lead or silicone flashing. The reason for the flexible flashing concept is that allowance must be made for the expansion of the metal flue. The flashing must allow the flue to slide up when hot and back again when cool. If adhered to, the system described ensures that the flue/roof interface will not leak due to expansion strain. WARNING: A rain proof cowl is essential - water down the chimney voids the warranty. The chimney must extend 1m above the level of the roof penetration and a minimum of 0.5m higher than any roof surface within 3m horizontally to achieve a stable draft. Due to prevailing winds, local terrain, adjacent tall trees or structures, additional chimney height or an extractor may be required to insure optimum performance. LP Gas Association approval and SABS approved. A Power Flue can be installed almost anywhere against a solid wall, and even in a corner. The venting system will depend on the fireplace design, the position in the room and the construction of the house. The fan installation can be high or low, with a maximum distance of 3.5 meters before venting to the outside and a minimum of 300mm above the ground. Hoods can have either a top or a rear fan exit. Height above work area should not be more than 900mm.